Try moving quickly through a sporting goods store with a newf. Just try. We finally left 3 Forks and headed towards the Montana border. ANY Montana border. Montana is fine but we hadn't planned on spending so much time here that we would be threatening to get a PO box. Being reminded that the stuff sack that came with my sleeping bag when I purchased it in 1974 was shredded and I really NEEDED a new one, I pulled in at a Cabella's to see if I could replace it. Typically I refuse to shop at a store with animal heads lining the walls but we needed a break - and I REALLY needed a new stuff sack. Shopping there, of course, would only happen if they would allow a newf inside. Luckily, they haven't gone the way of REI and banned live animals, so Arayo was in for a shopping treat. EVERYONE wanted to talk about or pet "the bear". One man approached me and said he'd heard that Newfoundlands are known for their guarding ability…. "Yes, if someone breaks into your house at night, they might not see the newf sleeping on the floor and could trip over it," I responded. However, the best response to Arayo came yesterday at the campground. Arayo and I were sitting in front of the office when a family drove up to check in. This was a set of grandparents and their two grand children. The young boy rushed out of the van and came over to Arayo, asking if she was a Newfoundland like Seaman. I assured her that she was and he spent about 10 minutes petting her. His grandmother got out and said they had been reading the Lewis and Clark book that is written from the perspective of their Newf, Seaman, and when they pulled up and saw Arayo "he got so excited he nearly wet himself!" the grandmother said, as she shot more photos of the grandson and Arayo together. 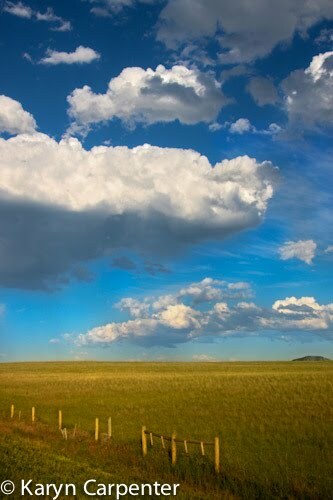 Photo - Montana really does have amazing skies! The story about the boy at the campground is amazing. You were in the right place at the right time, even if it meant staying in one state longer than you expected. That is a lifetime memory. I am sure shopping in air conditioning was a treat as well. Around here the only stores that allow animals are certain pet supply stores. Isn't it great that children are learning and relating to the Lewis and Clark story! Remington has been to class rooms and we read the story to the children. They get so excited! I hear you about taking a Newf shopping. We always have to figure an extra 15 - 20 minutes because everyone wants to see him! AND -- how right you are about a guard dog. That was so funny...."if they trip over them"....ha ha! Enjoy your trip, my friend! I love your blog! I'm a children's author (I see you like to write) and a Newfoundland lover. I just rescued another Newf a few months ago and am loving every minute of him. Please come visit! I'm loving the stories and how you tell them! I have visuals of lawn chairs flying off cars and Arayo steeling coolers of beer from the locals...LOL! Can't wait to hear more! The picture above is again just brilliant! I'm so glad you are shring your adventure with everyone. Something i can only dream of doing so I'm living it through you!